Tessa and Jon, both Oil City natives, wanted to be somewhere “where there was more going on” after graduating college. “We seriously discussed leaving the area, but we realized that being near our families was something that was important to both of us, so we decided to stay,” they said. 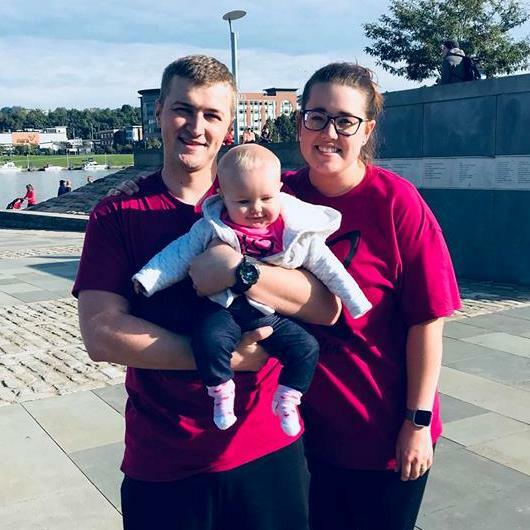 Tessa, who attended Edinboro University, works as executive assistant at the Venango Area Chamber of Commerce and Jon, an Indiana University of Pennsylvania graduate, is a police officer for the City of Oil City. The Byhams spend a lot of their free time with family between birthdays, holidays, and supporting siblings at sporting events. They enjoy going for walks in their neighborhood and downtown, attending local events, and going out to eat. Some of their favorite spots for shopping, eating, and entertainment include Amazing Foods, Karma Coffee Company, Spilling the Beans, The Movies at Cranberry, Benjamin’s Roadhouse, Trails to Ales Brewery, and The Liberty Galleria. They hope to become even more involved in the community through participating in Future Leaders and Entrepreneurs Exchange (FLEX), volunteering, and joining local groups and organizations. Tessa is also part of the inaugural class of Leadership Venango, a leadership program launched by the Venango Chamber in 2018. Tessa and Jon have a daughter (Charlotte), a dog (Cooper), and a cat (Louise), and they purchased a home in Oil City upon returning from college. “In a bigger city, you have to compete with hundreds of other people that have the same qualifications as you, and even if you beat out those other people, your ability to make an impact in your area and really get to see that impact is also going to be much harder,” they said.